This fresh collection of short stories by Southeast Asian writers, set in Indonesia, Malaysia, Thailand, Vietnam, the Philippines and Singapore, opens with a young girl in Manila who spontaneously erupts into flames. This sets the tone for the stories that follow, some of which are even more fantastical, encapsulating speculative fiction, science fiction, snippets from contemporary urban landscapes and possible ominous futures. All the stories play with the motif of heat in its various manifestations—its literality and its associations with frantic cities, crowded streets, busy street sides, spicy food, family warmth, raging passions, burning forests and fevered fancies that the tropical climate of the region generates. In their introduction, Khairani Barokka and Ng Yi-Sheng describe the collection as sketching what may be seen as a more conceptual than corporeal vision of Southeast Asia. Part of a trio of Southeast Asian urban anthologies—the other two are titled FLESH and TRASH—HEAT, as is mentioned on the first page, “interpret[s] urban as a state of mind.” It comes as no surprise, then, that while the stories plunge straight into the plot, they do not devote the greatest attention to physical descriptions of the city. But the way a city or landscape is drawn out is commendable, and is more than present enough to justify the book’s title and, in some instances, is rendered vividly, as are the interior worlds of the characters. The writers use a variety of modes of narration, which is in itself a declaration of a region coming of age. The people in these stories are struggling to express themselves through smoking up at hazy parties in a debauched cityscape in Kuala Lumpur; gobbling down chicken-rice chili at hawker centres in Singapore; thinking of their childhood in photographic stills in a Thai village, carrying out small kindnesses for one another, anxious to not fall behind while grappling with changing contemporary codes. Others are purchasing models of robot girlfriends at the ubiquitous shopping mall; breaking the laws of physics to construct a makeshift spaceship to travel to the sun; bringing people back from the brink of death with a mere touch; coming out as demons in a dimsum restaurant; and studying (out of school!) to hunt demons. Some are surreptitiously clicking photographs of couples making out in Kuching’s forested parks, or are running into small-time criminals in Hanoi. They are dreaming up postcard images of Boracay that are set against the developing island, or venturing into the taxi driver’s Manila. Further, they are translating language across Jakarta, Singapore, Chicago, Central Java and Kuala Lumpur. Others are demolishing skyscrapers in a dystopic future version of Kuala Lumpur while remembering Doha and Dubai; commanding the rain spirits to burst into the reservoir; or feeling forlorn at having to leave, for good, the murky town of Sentani, West Papua that they grew up in. These people are seeking refuge at air-conditioned malls, eating steamed pork buns and crunchy beansprouts at teahouses, feeding the house gods, filling their water containers or lighting bushfires. Over and above is the “neighbourhood’s unbroken mix of grinding, honking, hammering, and yelling” (Hon Du Muc, “Astray”) or “electric lighting, … party music, and the white noise of construction.” But then too, it can get “suddenly dark and deafeningly quiet on the beach,” “the hundred tea lights on the low beachfront tables mirroring the stars above on … a serendipitously clear night, and people’s hushed voices letting out an amused or reverent ‘Wow’” (Maffi Deparis and Ivery Del Campo, “Boracay Island: Postcards from the Past and Present”). Taken together, these eighteen vigorous stories provide less a brick-and-mortar description of the city than a compelling impression of the feverishly urbanizing Southeast Asia. Pallavi Narayan is Kitaab’s fiction editor. 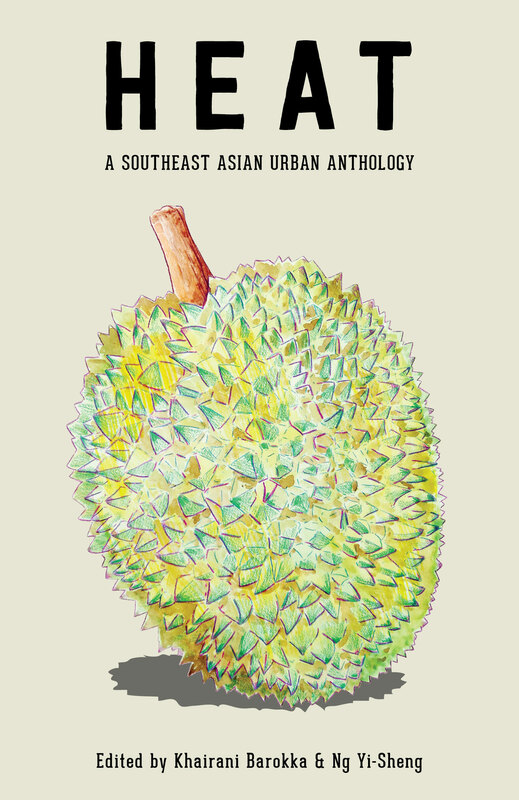 Posted in Book and tagged Heat: A Southeast Asian Urban Anthology. Bookmark the permalink.